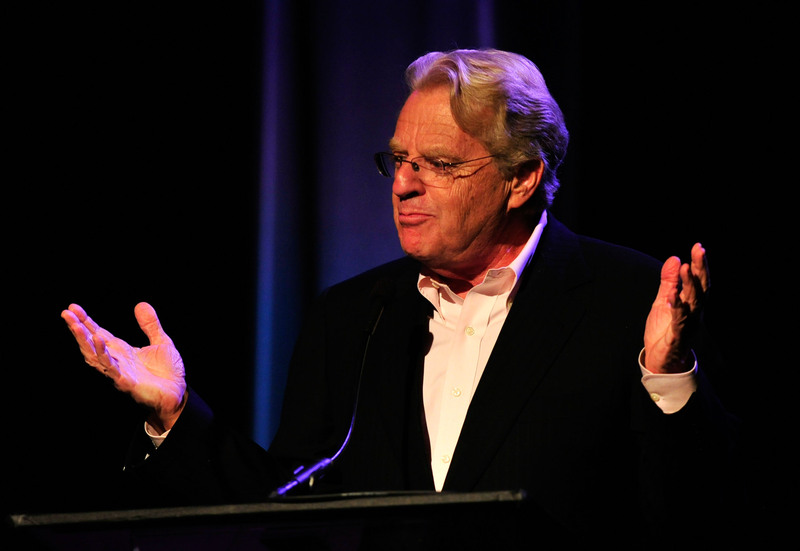 For years, Jerry Springer's overly dramatic and often-absurd television show has lent itself to many a punchline, but on Monday, the entertainer himself was the one making the joke. During Monday's primetime presidential debate, Springer tweeted about Donald Trump and Hillary Clinton and, perhaps, the next episode of his show? He isn't what you'd likely consider a pundit, but he might be on his way to a new career path, if he wants one. Monday's debate was certainly one for the books — or, rather, for The Jerry Springer Show highlight reels. It took place after days of the candidates battling back and forth over who was inviting whom to the event. (For his part, Trump quipped about getting revenge on Clinton by inviting one of her husband's former mistresses to attend.) The respective maturity levels continued when the primetime cameras started rolling, with Trump interrupting Clinton and moderator Lester Holt while trying to convince America that Clinton doesn't look like a president. Springer, who has seen his fair share of crazy over the course of his career, called it like he saw it. It's not the first time he has voiced his support for Clinton, but his tweet from the debate night may have been the most brutally honest way of assessing the situation. In that one tweet, he managed to troll both his notoriously iconic show and Trump. In July, Springer attended the Democratic National Convention (DNC) in Philadelphia, where Clinton officially accepted her party's nomination for the presidency. In an interview with Politico from the audience of the DNC, Springer called Trump "un-American." During the presidential race, Springer has fundraised and campaigned for Clinton. If he were to appear on Springer's show, Trump would be well-practiced when the inevitable argument broke out. During the roughly 90-minute debate on Monday, Trump reportedly interrupted Clinton a whopping 51 times. To compare, Clinton only interrupted Trump 17 times, and Holt interrupted Trump and Clinton 30 and 19 times, respectively. It's no surprise that Springer was impressed with Clinton's debating. A CNN/ORC poll following the debate showed that most viewers felt that Clinton had performed better on stage. It's also no surprise that Springer supports Clinton beyond the debate stage. In the 1970s, Springer served as the Democratic mayor of Cincinnati, Ohio. After that, he did actually have a brief stint as a political commentator. Given his witty — and accurate — tweet about Monday's debate, perhaps he should give that job another go.